DNA: The Results Are In! This past Thursday I got the email from MyHeritage, saying that my DNA testing results were available. Excited, I logged in, clicked on “View Results” and waited for that little wheel to spin and bring up the page. My Google Earth rendering of my ethnicity estimate. Absolutely no surprises here (with the exception of no Irish or Scottish, but on paper, that is a small sliver of my heritage), this matches my paper trail, so I know I’ve been barking up the right trees, so to speak. So do I match anyone in the MyHeritage DNA database? I had about 250 matches, all at about the fourth cousin or less level. (Some said first cousin twice removed or second cousin once removed, followed by “–fourth cousin”.) I filtered the matches by surname, and many that came up were my more common surnames — White, Williams, Scott, King. Most of the surnames went back to ancestors in the 1600s and 1700s, though! And nothing more recent than surnames of my great-great grandparents. 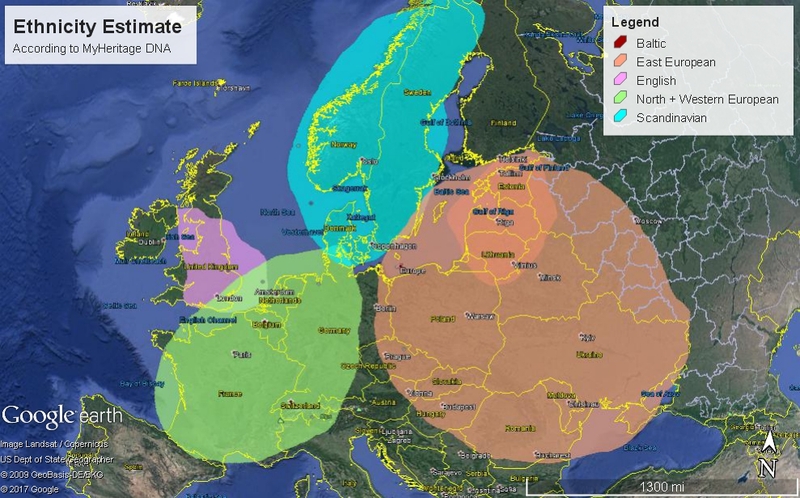 Nothing in Poland or Lithuania yet (though I noticed in MyHeritage’s DNA Terms & Conditions that Poland might not be able to use MyHeritage DNA). So my next step is to turn to GEDmatch. So far, I put my raw DNA in there, I just have to upload my gedcom. I’m hoping to find more relatives in that sandbox! I, like much of the genealogy community, was quite surprised by the announcement that MyHeritage was in the process of acquiring Legacy Family Tree’s software and webinar offerings. (See press releases here and here.) Before we go any further: I am a customer of both companies; because of this I’ve been thinking about what the acquisition will mean for me. I really can’t talk about others’ experiences or opinions, so I won’t. I can only share how this situation may impact me. I’ve been a MyHeritage customer for about seven years now (since the time my interest in genealogy took off). I found it by searching for a place to keep track of my family tree for free. 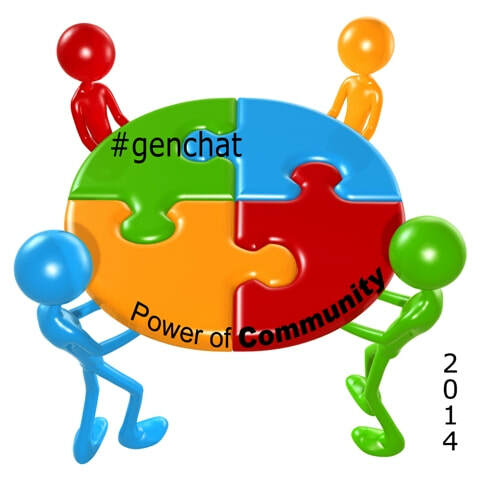 I knew nothing about offline software programs or even how to do genealogy the “right” way. I just knew I needed something and MyHeritage fit the bill. It wasn’t long before I outgrew the free 250-person level and I eventually became (and still am) a PremiumPlus member. 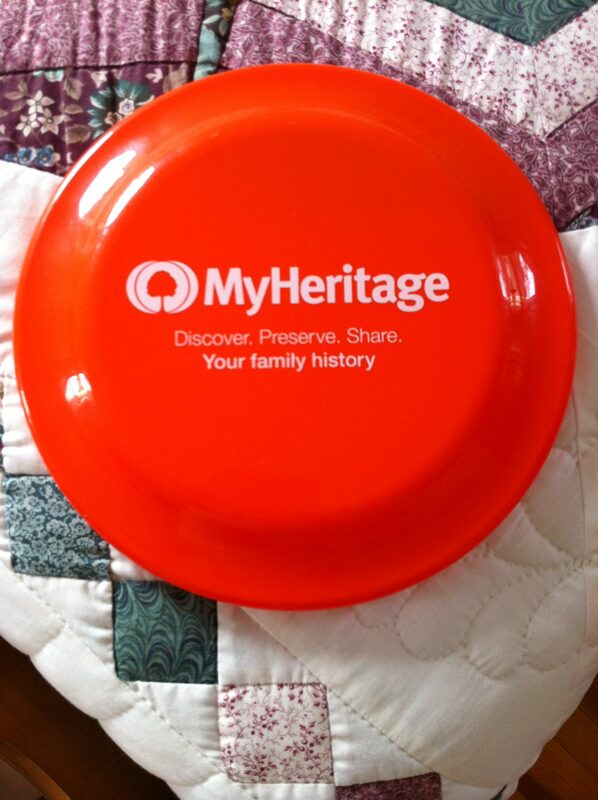 MyHeritage freebie from the Global Family Reunion! Author’s collection. I enjoyed the few (at the time) SmartMatches that came up on my tree. I soon heart that MyHeritage’s SmartMatch technology was pretty accurate, compared to other sites’ hints and matches. Back then, there were no record collections on MyHeritage. I think (and I may be wrong) that you could do some sort of a search that pointed you to other places that might have information on your ancestor, but it really was rudimentary. Also back in those days, there really wasn’t a way to cite your sources online (though the free software, Family Tree Builder, may have had a way). And speaking of Family Tree Builder, you originally could not sync back and forth between it and the online tree; you could only publish from FTB to the tree. Because of that, I didn’t use FTB until there was a two-way sync. As time went on, MyHeritage made some great improvements: source citation spaces, improved SmartMatches, two-way syncing with Family Tree Builder, and RecordMatches with a newly-growing database of records (which I don’t subscribe to the paid portion, though the unpaid portion has proved to be a bit useful). Even an iPhone app had been developed, which is so handy! Ancestry it’s not, but today’s MyHeritage has come a long way from when I first used it. Even though I had finally downloaded Family Tree Builder, I wasn’t too crazy about it. I wanted more functionality in my desktop program, but wasn’t sure which software to go with. Then one day I was watching a Legacy Family Tree webinar about some topic, and Geoff Rassmussen did a demonstration of how to use Legacy in regard to that topic. I really liked what I saw! Finally on a Black Friday sale a few years ago, I took the plunge and bought Legacy Deluxe, version 8. I’ve been using it ever since. I love the features of Legacy; it really fits the way my mind works. What’s made it even better is that there now an awesome Facebook group where you can discuss new features with the Legacy community and staff. The one problem I had that the Facebook group could not solve was quickly resolved by the support staff via its website. This past year, Legacy has come out with a version 9, but I’d held off on upgrading, waiting for any bugs to be worked out and for the financial time to be right. Meanwhile, I hadn’t used MyHeritage all that much, but had not wanted to give up on it just yet. So now we’ve received news of the acquisition. 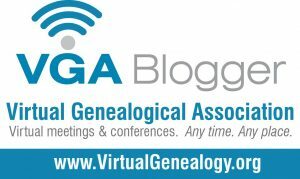 Like other recent changes in the genea-world (i.e., microfilm rental ceasing at FamilySearch, Ancestry no longer developing the Family Tree Maker software), there has been quite the emotional reaction online. My personal tendency is more towards: slice it, dice it and analyze it. The following is just my preliminary reaction. First, I hear that eventually there will be a sync available between Legacy and MyHeritage. For me, that would be awesome! My online tree is getting pretty out-dated, so this would solve that problem. I still have logistical questions on how it would work, but there will be plenty of time for that to be worked out. Second, I think MyHeritage could benefit greatly by the outstanding customer service that Legacy has demonstrated. In fact if I were to advise them, I would tell them: let the Legacy people do the customer service. They are that good. Third, I love MyHeritage’s free app so much more than the outsourced “Families” app that works with Legacy (and which I paid good money for). It’s much prettier and more flexible. Finally, Legacy Family Tree is now having a big sale to upgrade to or purchase version 9! My penny-pinching heart is so glad – my upgrade time has come! There are still so many questions to be answered by both parties (such as, will Family Tree Builder go away? Or will it be the free Legacy Standard version?). And I’m sure there are future developments on the horizon that we haven’t even thought of yet. My attitude is: let’s see what will happen and take advantage of the best that is offered!